Can you make it to the top of the climb and slide down before you opponent can. 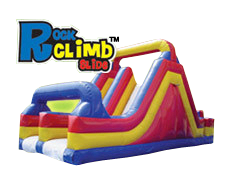 This Rock Climb slide can be used by itself or with the mini-obstacle turning it into a 78 ft run full of adventure that will keep everyone wanting more. This is the largest unit in our fleet, at over 70 plus feet in length it's for the physical fit to endure. It has something for everyone..turn it into a race and see if you can win. Climb to the top it you dare, at 20 ft in height this is a thrill everyone loves..Dual lanes make sure nobody is waiting in line. 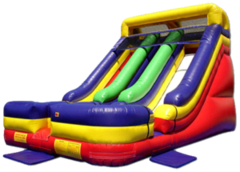 The backyard obstacle challenge is the perfect choice for your backyard birthday event. 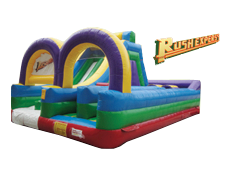 at 30 ft it has pop ups, blocking dummies, a climb and slide. It will keep them busy for hours. It's a knock out... Not really, the gloves are so big, that this one is all about fun. 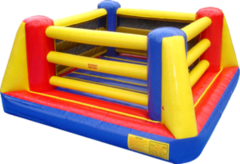 You can bounce and box your way to the title match. Touchdown!!! Can you get your ball in the goal before your opponent pulls you away and scores his own goal.You are attached to your opponent by a bungee cord and it's a pull of a good time. Hang on you will be going for a ride. CAn you be king of the Octagon.... 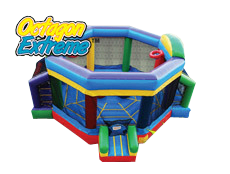 It has Joust pedestals, basketball goals and even Kick ball goals and a giant jump area. This one is for the big kid in all of us.